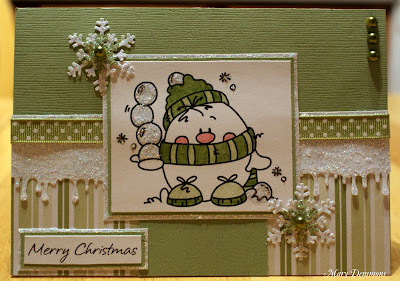 My card below features Eggbert Winter from Bugaboo Stamps. I just love this image. He's so cute and so much fun to color. This time I chose to color him in one of my favorite colors (sage green). If you are a regular visitor to my blog than you already know that I love adding sparkle to my Christmas cards. And of course I added some to this one too. I started my card by covering the top half in lilypond cardstock and the bottom half in sage stripe patterned paper. I added a strip of lilypond cardstock to the middle section of the striped paper. I then punched out the drippy goo border in white and added a some green & white dotted ribbon to it. I added diamond stickles above the ribbon and to the bottom punched border. I backed my image in lilypond and white cardstock. I added stickles to the image and to the white cardstock around the image and the sentiment. I then punched large snowflakes out of white cardstock and small snowflakes out of green. I added the smaller to the larger and added stickles to it and then a green pearl in the center. Then I finished it off with some green pearls into the upper right corner. The challenge this week at Cute Card Thursday is called blast from the past. The challenge is to create a card/project using one of their past challenges. I chose to use challenge #37 ~ snowflakes. What a fabulous card Mary, love your colourway, adorable Eggbert, great glittering and such lovely details. This is beautiful Mary!! I love how you used the drippy goo punch..will have to remember that. Love the colors and the snowflakes! Fabulous card and that image is just too cute! Thanks for joining in with Daring Cardmakers. Gorgeous card. love those colours and sweet image. Thanks for sharing at ABC this time. Damn, pretty great topic. How can I get your subscription? That little snowball is so adorable!!! Thanks so much for sharing your work with us in the Simon Says Stamp Challenge!! !